Judy Shaw hardly knows how to sit still. The recent retiree from a quarter of century tenure at GreyStone Power Corporation in Douglasville, GA always had a community service project on hand when she was working. 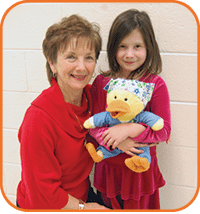 But when her granddaughter was diagnosed with cancer a few years back, Shaw’s community service actions fell into step with the work of Gabe’s Chemo Duck Program and she hasn’t looked back since. Ashley Shaw had been diagnosed with rhabdomyosarcoma when she was just 5 years old. She hadn’t known about Chemo Duck during her treatments, which spanned a year, but Ashley’s mother, Elaine, found Gabe’s story online after Ashley had finished her treatments. The family was amazed and heartened by Gabe’s story, which was quite similar to Ashley’s. The 2010 Mall Waddle was a great success and the employee group held similar events during the next two years. When another GreyStone employee’s son was getting chemotherapy treatments for a rare disorder, Judy shared the story with Lu and the Chemo Duck Program. The most important GreyStone fundraiser for Chemo Duck turned out to be the one Shaw didn’t even know about. When they were preparing for Shaw’s retirement, a fellow employee at GreyStone asked if anyone wanted to purchase a Chemo Duck in my honor. They raised $1100! There were little yellow rubber ducks in a bowl at the party representing the 44 ducks that were purchased in her honor. “That was the best present they could have given me,” Shaw said. The past three years GreyStone employees have raised more than $11,000 for Gabe’s Chemo Duck Program and have been able to supply two area pediatric cancer programs with enough ducks for the children they serve. Ashley completed her last treatment on New Year’s Eve in 2008 (also the eve of Gabe Sipos’s birthday). Now Ashley is doing well and enjoying fourth grade.